The journey through Taroko Gorge National Park in Taiwan is one of the nicest rides I’ve been on in all our travels. We’ve returned twice to this unbelievable jewel of a national park and each time our experience has been different. Even with the light rain showers, we still made our way slowly along the road from Hualian to Tienshieng. We stopped for an hour at the Visitor’s Center to avoid the worst of the rain and then spent the rest of the afternoon riding, stopping and hiking to get the best views. Photographs never do true justice to the majesty of Mother Nature, but some of them can come mighty close! The rain was a deterrent for most visitors and we had the roads and trails to ourselves. At one point, we had to stop and wait out a particularly hard downpour, but it only lasted ten minutes and when it finished, we discovered an old concrete set of stairs leading down into the forest. We decided to follow it and as we descended, the forest suddenly erupted into a frenzy of screeching and howling as a pack of forest monkeys popped out of the underbrush and raced along the riverbank opposite us. The trail we were on eventually led down to the waters edge. We could see the water marks on the canyon walls high above us as the dirty, gray water rushed past us at a furious speed. We stopped to sit and enjoy the scenery for awhile, but all too soon it was time to move on. This year, we opted to spend the money and stay at The Grand Formosa. Here are some of my photos from that trip. Amazing photos (as usual). 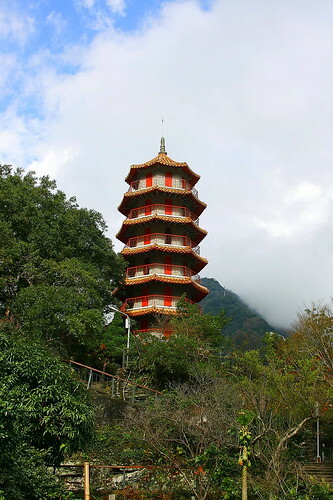 When Jean and I went last month, we also went to Taroko and you’re right, photos (even as nice as yours) don’t do justice on how amazing the views were there, huh? Looks fantastic. I have been longing to get there ever since I read about your bike trip. Thanks for stopping by again. 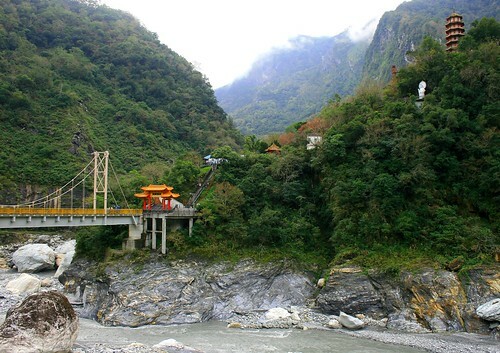 You know what absolutely kills me about visiting Taroko Gorge? All the visitors who go and snap pictures from inside their cars! John and I have been there twice and we’re always thrilled to be on the bike and up close and personal with Mother Nature. We always see people parked on the side of the road with their cameras stuck out the window. It’s sooooo funny. I’m glad I’m able to bring a little piece of home to your doorstep. I can’t wait for you to go, only because I enjoy your photography so much! Hey Carrie, thank you so much for your excellent blogs on Toroko from this n past year. Thats the reason I finally made a trip down there last weekend after 2 years in Taiwan. I think my writing skills are too limited to describe how wonderful the place is but you have already done justice through your pictures and writing for that. I haven’t had time to write about it on my blog but I will on this weekend most likely. YAY Ashish. That’s great news! I’m glad I was able to provide a little inspiration. 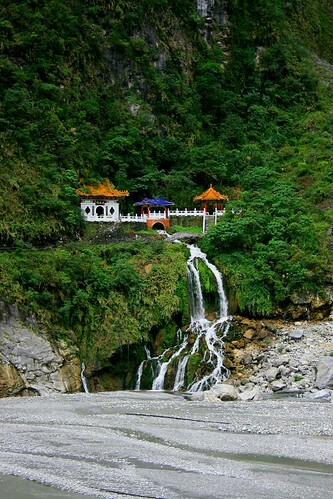 Taroko is one of my favorite places. Honestly, I never fail to be completely blown away by its beauty. Can’t wait to see your photos. I bet they’re top-notch!